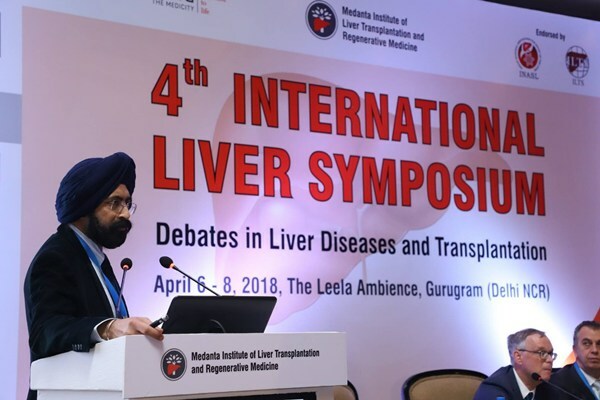 Medanta Institute of Liver Transplantation and Regenerative Medicine recently organised the 4th International Liver Symposium (ILS) in Gurugram. The event saw participation from experts from across the world, representing the frontiers of knowledge from 22 countries. Experts shared perspectives and new learnings on hepatology, liver surgery and transplantation, deliberating on practice and direction of liver diseases and transplantation. The three-day symposium based on the theme of ‘Debates in Liver Diseases and Transplantation’ offered a unique academic platform and had world’s leading experts and key opinion leaders like Dr Patrizia Burra (Associate Professor of Gastroenterology, University Hospital of Padova-Italy), Dr David GRANT, FRCSC (Professor of Surgery at the University of Toronto), Prof Anil Dhawan MD FRCPCH (Kings College Hospital, London, UK) and Prof Nigel Heaton (Head of Liver Transplantation at King’s College Hospital NHSFT) along with renowned experts from Institute of Liver Transplantation and Regenerative Medicine, Medanta – The Medicity, including Dr AS Soin, Chairman and Chief Surgeon, Dr Neelam Mohan, Director, Paediatric Liver Transplant, Dr S Saigal, Director, Hepatology and Dr N Saraf, Director, Hepatology. Dr AS Soin elaborated on Medanta’s globally acknowledged protocol, which now enables successful cure of advanced stage four liver cancer by combining cyberknife and TARE, followed by transplant. He also spoke about the role of machine learning algorithms and artificial intelligence in donor–recipient matching, and outcome after liver transplantation. The group of experts additionally deliberated on alternative approaches to managing and treating hepatitis, Non-Alcoholic Fatty Liver Disease (NAFLD), Acute-on-chronic Liver Failure (ACLF), Alcoholic Liver Disease, Hepatocellular carcinoma (HCC), Hepatic Surgery and Critical Care in adults and children.